Gathering everyone’s favorite Christmas charters in one heartwarming Christmas tale, “Santa’s Sleigh-Train” reminds readers that great things can be achieved if everyone is willing to work hand in hand. This story proves that it takes teamwork, determination, and positivity to make things happen! Dr. Dorinda E. Shelley features Santa and Rudolph together with all the elves and the reindeer at the North Pole in a new Christmas adventure that will surely delight all the young ones. In this book, she teams up with illustrator, Eleanor A. Hutton, to make each colorful page come alive and hopefully put a smile on the face of every reader. “Santa’s Sleigh-Train” is a spirited and heartwarming tale that begins during a very busy Christmas Eve. As everyone at the North Pole is busy preparing the gifts to be delivered that night, Rudolph discovers that he’s sick with reindeer pox. Panicked, Santa, the elves, and all the other reindeer have to find a way to deliver all the presents in time and on schedule! Everyone, including Rudolph, must work together to find a solution before time runs out. Thankfully, Santa finds a toy train and some magic dust. Through these items, Santa can bring his Christmas mission to success and make all the children happy on Christmas Day. Ultimately, it takes teamwork, determination, and positivity to make things happen! 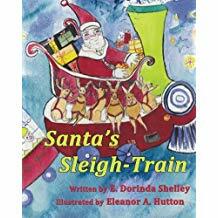 Reaching out to a wider audience, Shelley’s delightful “Santa’s Sleigh-Train” joins the upcoming 2019 London Book Fair New Title Showcase on March 12-14, 2018. Attendees and children’s book fans will surely find this story a delight for young ones everywhere. Therefore, be sure not to miss this exciting literary affair! Dr. E. Dorinda Shelley is a retired dermatologist who now runs used bookstores and art galleries in Grand Rapids, Ohio. This is her fourth children’s book. Illustrator Eleanor A. Hutton is a graduate of Maumee Valley Country Day School in Toledo, Ohio and The College of Wooster, Ohio. Ms. Hutton has previously illustrated five children’s books, authored one and co-authored another.